Due to the optional use of perforated and slotted sheets vibration screens are suitable for any grading tasks encountered in the paper industry, both in the low and high-density range. The vibration screens is suitable for universal use. Due to its design and allowing the use of perforated or slotted sheets for grading, the grader is easily adjusted to any type of fibrous material. Due to fast removal of coarse screenings based on a relatively high vibration frequency of the screening basket and the chosen vibration amplitude being higher than the maximum fibre length encountered, smooth operation without any spinning or blocking will be feasible. Improved removal of coarse screenings by use of a baffle flap below the screening sheet. Depending on the graded size, the pulp will pass through one or two inlets towards the screening basket. Screened coarse screenings are carried out through the screening basket projecting from of the grader. In order to support the grading effect, accepts are dammed by an adjustable overflow flap within the tub. Overflowing accepts will leave the grader by an aperture in the tub bottom. A spray pipe is used for back-washing of any good fibres adhering to coarse screenings. The vibration screens is covered by a plastic canopy. This canopy and the screening basket may be easily folded up and/or removed for cleaning. 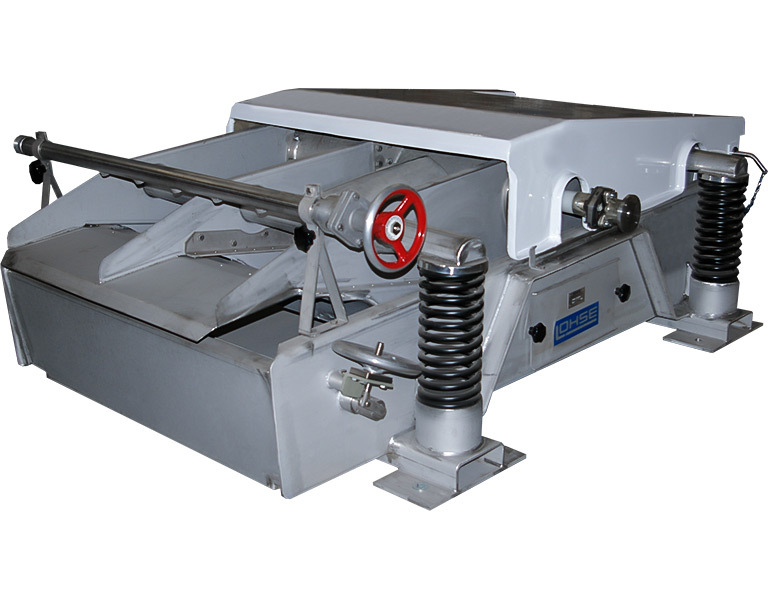 This robust vibration screen with a large screening area is used in wood grinding plants as a means to catch tailings and thus to separate the splinters and tailings from ground wood. The vibration screen is suitable for universal use. Due to its design and allowing the use of perforated sheets for grading, the grader is easily adjusted to any type of fibrous material. Depending on the graded size, the pulp will pass through one or two inlets towards the screening basket. Screened coarse screenings are carried out through the screening basket projecting from of the grader. In order to support the grading effect, accepts are dammed by an adjustable overflow flap within the tub. Overflowing accepts will leave the grader by an aperture in the tub bottom. A spray pipe is used for back-washing of any good fibres adhering to coarse screenings. The screening basket may be easily folded up and/or removed for cleaning.